Another of the South End pics from last Friday. 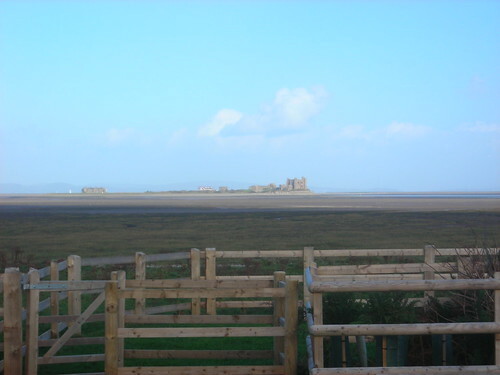 This one is looking across to Piel Island, which is a distant prospect from most parts of Barrow. Piel is a part of Barrow, of course. It has a ruined castle (on the right), a row of coastguard cottages (on the left) and a pub, the whitewashed building in the middle. The landlord of the pub, which is owned by the borough council, is given the title King of Piel. The title has been in abeyance for a few years while the pub was renovated, but it has recently been filled. The island is accessed by ferry from Roa Island, and it’s possible to walk across the sands from the South End at low tide. We haven’t done Piel yet, and we will eventually but it won’t be before the spring now. It’s a pretty bleak and inhospitable place in the windetr. A ruined castle? Who ruined it? And why?!? I think it just fell into disuse and fell victim to the weather.